​Established in 2016, the Laurelton Neighborhood Association aims to enhance quality of life in our neighborhood by increasing communication among neighbors and bringing them together through projects, events and initiatives. Right on the edge of Irondequoit, the Laurelton Neighborhood is immediately adjacent to some wonderful city neighborhoods with great amenities while also convenient to shopping and services in Irondequoit and the nearby Empire Blvd commercial area. Many residents enjoy spending summer evenings at the local ice cream parlor, Netsins. One of the most established neighborhood identities, the street grid, plentiful sidewalks, and antique harp style street lights make this one of Irondequoit’s most walkable communities. Our next General Meeting will be on May 1st, 2019 at 7 pm at the Merchants Grill. 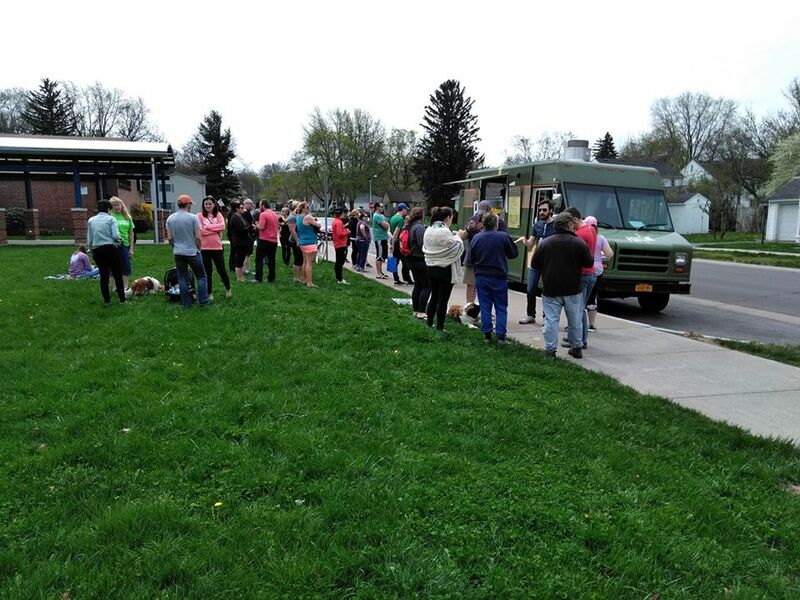 Crowd at the Le Petit Poutine Food Truck During the 2018 Laurelton Neighborhood Garage Sale. Our neighborhood is the largest in Irondequoit with well over 1,500 homes. So we need your help! Want to help us spread the word? We're looking for block captains. And, of course, attending a meeting or event is a great way to get your feet wet! ​Along with visiting our website, you can sign up for our emails, our Laurelton Ledger newsletter and "like" our Facebook and Twitter pages. These are great ways to keep in touch and learn about everything going on in our neighborhood.